Who needs a real keyboard, amirite? Let's face it: Tablets are on the brink of death, and it's difficult to get excited about a new slate these days. And even though tablet-laptop hybrids are taking off, that market is cornered by Surfaces and iPad Pros. So I wasn't prepared to be as thrilled as I was by Lenovo's latest offering. The Yoga Book, based on my experience with a preview unit, is not merely a mimicry of Microsoft's Surface Book; it has impressively innovative features and a well-thought-out interface that make it a solid hybrid in its own right. The Yoga Book has the same shiny "Watchband hinge" as Lenovo's Yoga 900 convertible laptops, which makes the book's spine look like links on a wristwatch. That, together with a metal casing and slim silhouette, lend the book a clean, modern aesthetic. I particularly like the gold version, which is only available for the Android variant that costs $499. A $549 Windows 10 model is also available, but that (disappointingly) only comes in black. This book's cover may be pretty, but what really impressed me lies beneath. 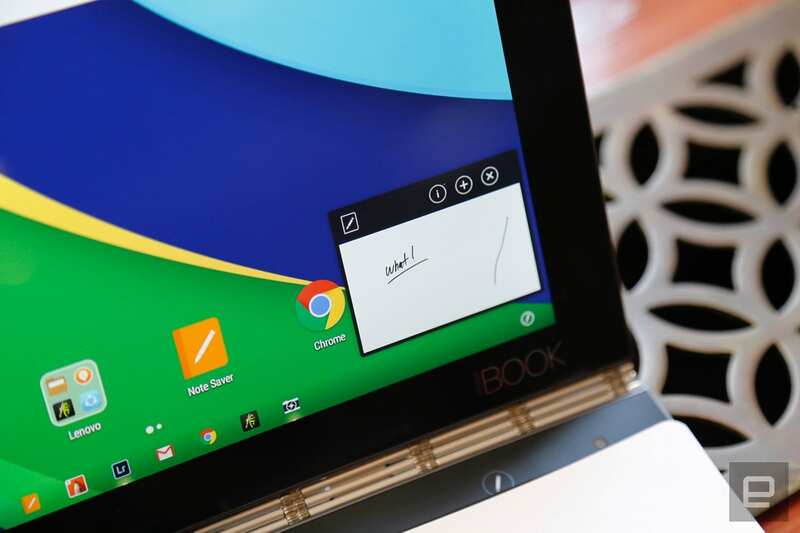 The Yoga Book's standout feature is its keyboard, which is essentially a giant touchpad. There are no physical buttons -- just a flat surface with the outline of keys. The absence of physical buttons helps the Yoga Book look and feel more like a regular tablet with a flat back when you unfold it all the way around. Plus, without the uneven surface, you can use the bottom half of the device as a stand, with the keyboard facing down. The hybrid is also a lot lighter (1.52 pounds) than it would have been with a full keyboard, although it's still heavier than the Surface 3 (1.37 pounds without a keyboard). But those aren't the main reasons for doing away with keys. 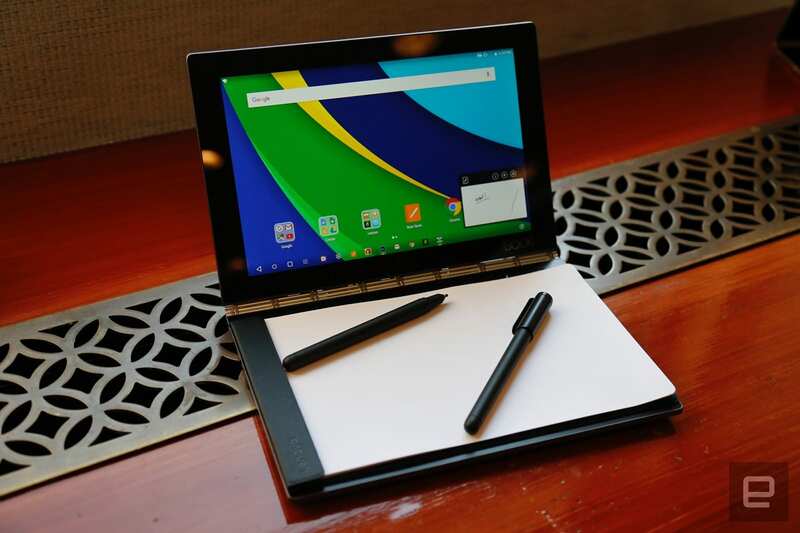 The real pièce de résistance is housed within the flat surface, and Lenovo calls it the "Create Pad." Tap a button to the top right of the keyboard and the outlines disappear, leaving you with a blank canvas. It's like a Wacom digitizer tablet that you can draw on with the included stylus. Lenovo adapted Android 6.0 Marshmallow to automatically start recording your doodles in the company's default note-taking app (which is the only app in the tablet that stores your input in the background) once you put the stylus to the touchpad. When you start writing, a small window pops up on the bottom right of the screen and captures your scrawls. This happens whether the tablet is awake or asleep, which is super convenient. It's basically like having a piece of paper ready for you to write on whenever you need, and it worked well in our demo. But because the screen stays off when you're writing while the Yoga Book is asleep, it's hard to know what you're jotting down. Those who can't give up their paper addiction, however, will love this next feature. With a little finesse and jiggling of the stylus' nib with the included pen cap, you can pull out the nib and replace it with an ink cartridge to make a real pen. Oh, and did I mention that "Real Pen" is what Lenovo named this stylus? With the ink nib, you can write on real paper for a more old-school experience. And if you place the paper on the Create Pad, whatever you scrawl there will also show up in the Yoga Book. I tried placing an inch-thick notebook on top of the surface and wrote on it with the Real Pen, and I was impressed when the system still detected my scribbles. This won't work with a regular pen, though; you'll have to use the one Lenovo provides. It's designed with Wacom's "feel IT" tech that responds to the electromagnetic resonance (EMR) film built into the keyboard, which enables the real-time digitization. All of this adds up to an experience that will delight and win over notetakers, and I'm incredibly stoked by what I've seen so far. But I don't think the Yoga Book will appeal to road warriors. Sure, the Windows version will run desktop apps and multiple apps simultaneously, making it suitable for productivity. The Android version has Lenovo's multiwindow support (until it gets updated to Android Nougat, which has that feature baked in), so it can handle multitasking as well. 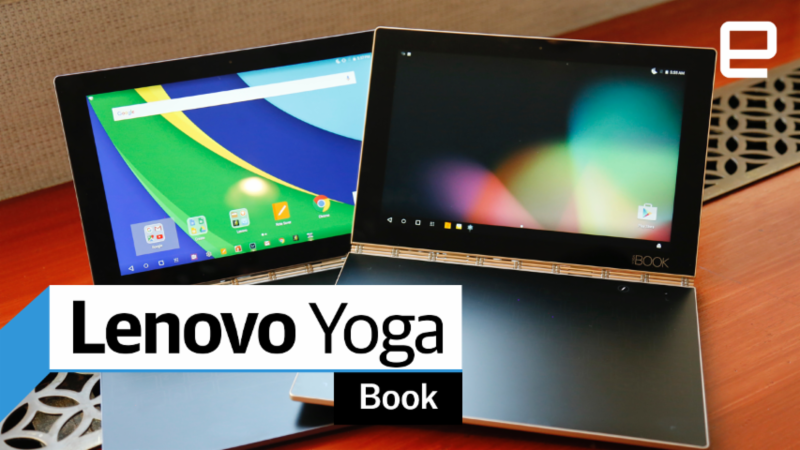 The Yoga Book is powered by an Intel Atom x5 processor and has a generous 8500mAh battery that Lenovo said should last for up to 15 hours of general use. Its 10.1-inch 1920 x 1200 IPS display should also be a decent canvas for multimedia. But for a 2-in-1 to truly facilitate productivity, it needs a real keyboard. Even though Lenovo thoughtfully designed the layout with more generously sized keys and spaces and implemented haptic feedback, predictive text and autocorrect (the latter two are only on the Android model), I still struggled to bang out more than a few words at once without a typo. Lenovo said it would take about two hours to get used to the new keyboard, but I'm not sure I believe that. The stark change may alienate those who depend heavily on physical keys. For those people, Lenovo still has slightly more traditional hybrids. 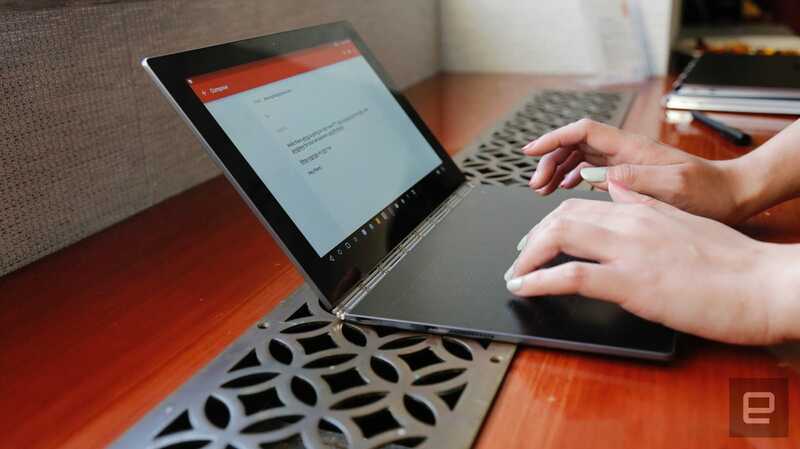 The company also unveiled a super thin Yoga 910 convertible laptop, which has a full-sized physical keyboard and bends all the way around to become a 14-inch tablet. 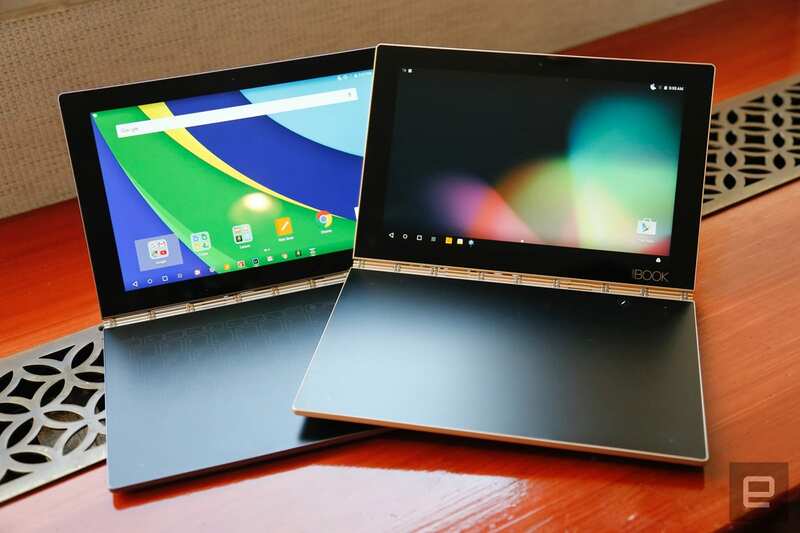 Still, Lenovo deserves props for making a bold, innovative move. As a lover of notebooks and real-life writing, I can't deny that I'm incredibly excited to try out the Yoga Book in the real world. And for those who prefer pen and paper (I imagine that includes artists, designers and students), the Yoga Book is a compelling candidate that could trump the iPad Pro and Surface. We're live all week from Berlin, Germany, for IFA 2016. Click here to catch up on all the news from the show.